Aspen is a Norm. A non-magic. A human. And in the magically hidden boroughs of New York City, that’s a quick way to wind up dead. Or worse. 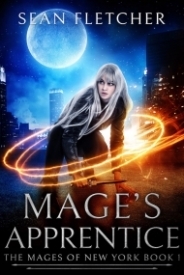 So instead of magic, Aspen relies on her skills as a thief to stay alive. She didn’t plan to get caught stealing from Lucien Dunadine, one of the strongest members on the Council of Mages. She really didn’t plan on him blackmailing her into being his apprentice. But with the Council demanding Lucien present a candidate for a competition to become their newest Mage, neither one of them has much choice. Now something sinister is going down in the magical boroughs. Supernaturals are winding up dead and mysteriously, impossibly, drained of magic. If Isak, Aspen’s handsome, aggravating opponent in the competition, doesn’t kill her first, the two of them just might be able to figure out who’s behind the murders before an ancient evil is unleashed. Welcome to the boroughs. Let the magic begin.